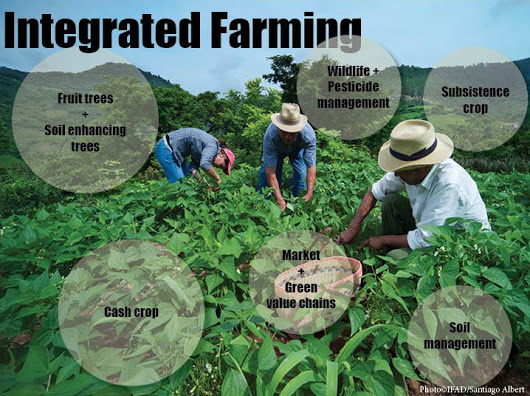 farming system is integration of crops, livestock, aquaculture, agro-forestry, agri-horticulture etc. for efficient use of farm resources to augment farm income and sustainability in production. system has been coined. A specialized farming system is one which concentrates on single cropping system or sequence of farming enterprises like animal breeding, dairying etc. to achieve the highest degree of precision management with minimal diversion of resources/attention to diverse crops or enterprises, differing widely in managerial skills and involving extremely different implements and/or handling capabilities for the produce. on a few crops, animals and related subsidiary professions (Jayanthi et al 2002). It appears that the farming systems approach is not entirely a new approach to farming communities in developing countries and India is not an exception. An insight into traditional farm activities in India, earlier to 1950s, clearly indicates that intensive farming systems were in existence from times immemorial. A farming system may comprise one or more than one enterprise and in most situations, only one of them is of primary importance around which the entire farm activities revolve, where as others, if any, may of secondary or tertiary importance. Farmers’ resource base and his needs are important and not the multiplicity of enterprises on his under farming systems approach. High altitude cold desert: Pastures with forestry, goats, rabbits along with limited crops like millets, wheat, barley and fodders. Arid and desert regions: Animal husbandry with camels, sheep and goat with moderate crop component involving pearl millet, wheat, pulses and fodders. Western and Central Himalayas: Emphasis on horticultural crops with crops like maize, wheat, rice, pulses and fodders on terraces. Eastern Himalayas: Crops like cereals, millets and pulses and agoforestry. Piggery and poultry are also ideal. Indo-Gangetic Plains: intensive crop husbandry involving rice, maize, wheat, mustard and pulses and dairy. Central and southern highlands: crops such as millets, pulses, and cotton along with dairy cattle, shee, goat and poultry. Western Ghats: Plantation crops, rice and pulses. Livestock components include cattle, sheep and goats.